This is what I written down for Gigabyte Tech Zone but I don't want to wait a month or 2 for the reply. Drivers are loaded on a USB Thumb Drive but I did try a floppy disk at one stage but may not have had the correct drivers on the floppy drive. The USB Thumb Drive had all Vista & Windows 7 Drivers available on Gigabyte Website on it. To continue installation use the 'Load Driver' option to install 32-bit and signed 64-bit drivers. Device Driver is not supported and might result in an unusable Windows installation. OK, I just found that it is looking for mass storage driver for installation and looking where i want to install it to. It could be that the system is still looking for a RAID ARRAY drivers as I think in boot up it still says there is no drives for the RAID ARRAY but I am not sure as it is so fast I cant even pause it in time. I did redo the RAID setup in the BIOS and then went into the RAID ARRAY setup and deleted the RAID0 setup there. Then I tried to load the Mass storage Drivers again when installing Windows 7, but still no luck. This is basically as far as I can get and there is no Hard Drive like there is shown in this picture, so this leads me to believe I need to still dispose of the RAID ARRAY setup from the previous Vista install in the BIOS possibly. But I am not sure what to do as I thought I would just Disable RAID in the BIOS. Can you not use the restore BIOS to default settings options then use the windows setup options to delete any possible boot partitions holding information regards booting raid 0 from your drives. 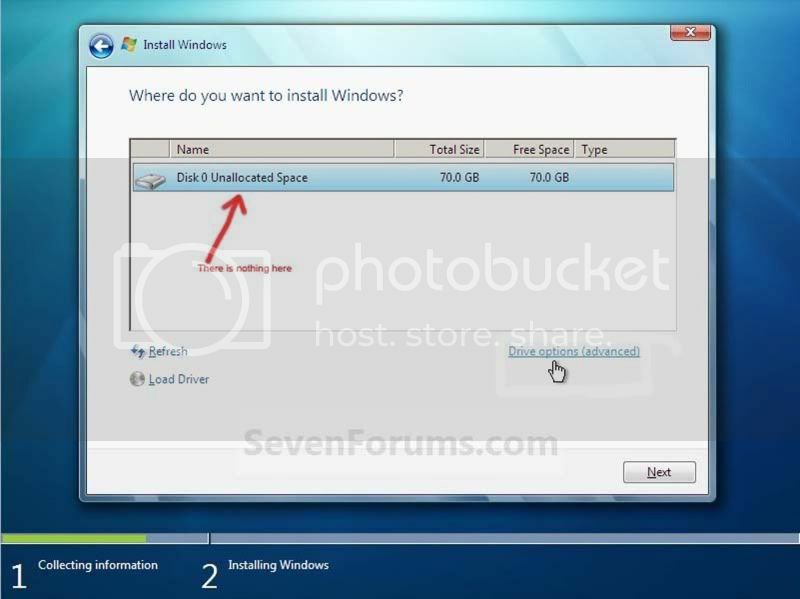 You should then be able to install windows 7 normally and install your drivers once windows is installed.